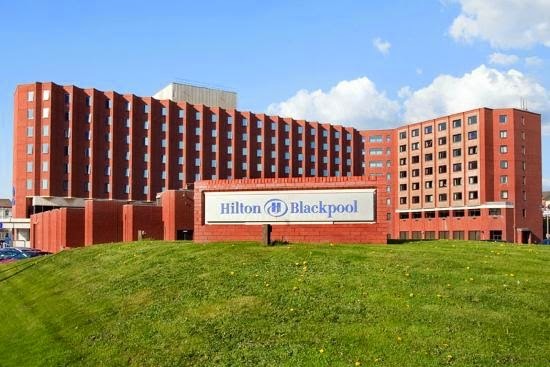 On Sunday 31st August 2014 I ran The Blackpool Hilton Illuminations Half Marathon. I set the alarm for 7am and felt very tired when it went off, all I wanted to do was turn it off and snuggle back under the duvet! I had had a late night as I was being "Taxi" for my husband who was out on a night out! Probably not the best preparation for a race but I forced myself out of bed, and I was pleased to see clear blue skies when I drew back the curtains! I got dressed in my running gear before having my usual race day breakfast of porridge and coffee. I was using my gel flask for the first time during a race and carefully squeezed 3 gels into the flask before attaching it to my race belt! We left our home in Kendal for the 57 mile journey to Blackpool at around 8am. We got there much sooner than expected, parked in the allocated race car park which was a field next to the Hilton Hotel. It was £2 for all day parking. The race Head Quarters was in the hotel and we went in to collect my race number. It was well organised with numbers set out in name alphabetical order. It all went very smoothly and I was ready with my race number pinned on my vest by around 9:15am! I was disappointed to discover that this was not a chipped event. I thought I had read that it was in the race details but perhaps I had just assumed it was! The race didn't start until 10am so we kept warm by loitering in the hotel. Although it was a very sunny morning there was quite a strong wind that kept it cold. After studying the weather forecast I had dressed in shorts and a vest top, and I was beginning to think this was a mistake. I used the toilet facilities in the hotel (better than the normal Porto loos!) and at around 9:45am we headed out to find the start line which we had been told was just across the road from the hotel. When we first exited the hotel I felt slightly stressed when I couldn't see a start line or any runners anywhere! We crossed the road as directed and peered over the promenade wall! Thankfully there was another lower level promenade and that's where the start and finish line were hiding along with the mass of other runners! We headed down the steps to get to the start and at this point with only 5 minutes to go I took off my long trousers and hoody and stood shivering in my shorts and vest. We got ushered to the start line by a Marshall with only a couple of minutes to go. I positioned myself in the middle of the pack, not wanting to be too close to the front for fear of getting in the way of faster runners, but not wanting to be held back by slower runners. This is the main issue I hate with a non-chipped race! I don't like to be too far back and jeopardise a good time! There was a short countdown and before I knew it we were on our way. I had tried to find a race route on the Internet but had failed so I was totally ignorant about where I was heading! It was a bit of a strange route starting with a loop measuring about 1.5 miles which we ran twice! This meant that after starting we passed the start line twice! Great for the spectators but not so great for runners wanting an interesting run! Once we had run this loop twice the route went straight along the promenade heading out of the centre of Blackpool. It was at this point that I began to notice the wind! As well as the wind there was a lot of dry sand on the prom which made it a fairly slippery surface to run on. We had the usual walkers and cyclists causing obstacles for us to avoid as well as people fishing. I realised fairly early on that it was safer to keep to the right hand side of the prom to avoid tripping over a fishing rod propped up against the prom wall or getting hooked by one as they cast out! We came across the first water station at around the 3 mile mark and I took the opportunity to take a slurp from my gel flask whilst I had water to wash it down with! Thankfully it was bottled water but I was disappointed that they didn't have sport caps. Having a lidless bottle made it difficult to run and drink without getting drenched in the process! At around the 6 mile mark we headed up off the lower prom looping back towards the tower on what I think was the upper prom! There was another water station at this point so I took another slurp out of my gel flask. Once we got off the lower prom we were sheltered from the wind but by then the sun felt really hot! We ran along the upper prom for approximately 2 miles before looping down again onto the lower promenade to repeat the same section of the route again and passing the 3 mile water station for a second time! This give me another opportunity to take on board some much needed energy in the form of a gel! By now I felt like I was really flagging! Despite it being a beautiful, clear day with fabulous sea views I found the lower promenade section of the route tedious and I struggled to keep going mentally during this section and could feel myself slowing down! At around the 10 mile mark we looped back up on the upper prom again! At this point there was a "water station ahead" sign so I took the rest of my gel in preparation to wash it down with water! I was dismayed to realise that there was actually no water at this station! I am not sure whether they had run out or whether this water station was only supposed to be open for the first loop only! Either way with the sun now being very hot and me having a sickly gel taste in my mouth I was feeling desperate and evidently so were other runners! I saw people picking up half empty discarded bottles off the ground and drinking them! I was desperate but not THAT desperate! This time once we were on the upper prom we headed into Blackpool towards the tower and the finish line. As the finish line came into view I tried my best to increase my speed and to do a "sprint" finish! I was delighted when I stopped my Garmin to see a 1:57:52 time. It wasn't a PB for me but it was a better time than I expected! I really felt like I had slowed to a crawling pace and struggled towards the end! However, not a bad result considering my legs were already tired after running 16 miles a few days before! After I had passed through the finishers arch I was handed a well earned medal and a bottle of water but no goody bag and not even a banana! After running this race I can understand why they don't publicise the route! As I have discovered writing this blog its far too complicated to try and explain! Click here to see my Garmin page to try and help you make sense of my ramblings! The official results were very close to my Garmin results and say I came in at 1:57:53 only a second slower than I thought! I came 183rd out of a total of 312 finishers! Click to see enlarged picture! All in all a very well organised and enjoyable race! The gel flask I used was marvellous! No more sticky fingers from battling with opening gel sachets! I'm glad I didn't need the toilet as I didn't see any en route at all! We had been told there were toilets and a 20p coin was needed to operate them. I was prepared with my 20p coin but I have no idea where they were if I had needed them! We were incredibly lucky with the weather but I think on a bad day this route would have been horrendous! A race that I am pleased to have done but not one I would choose to repeat!